李靖, 廖梅杰, 李彬, 王印庚, 荣小军, 张正, 范瑞用, 刘安然. 养殖刺参早期发育阶段体内可培养细菌的菌群特征及其与环境菌群相关性分析[J]. 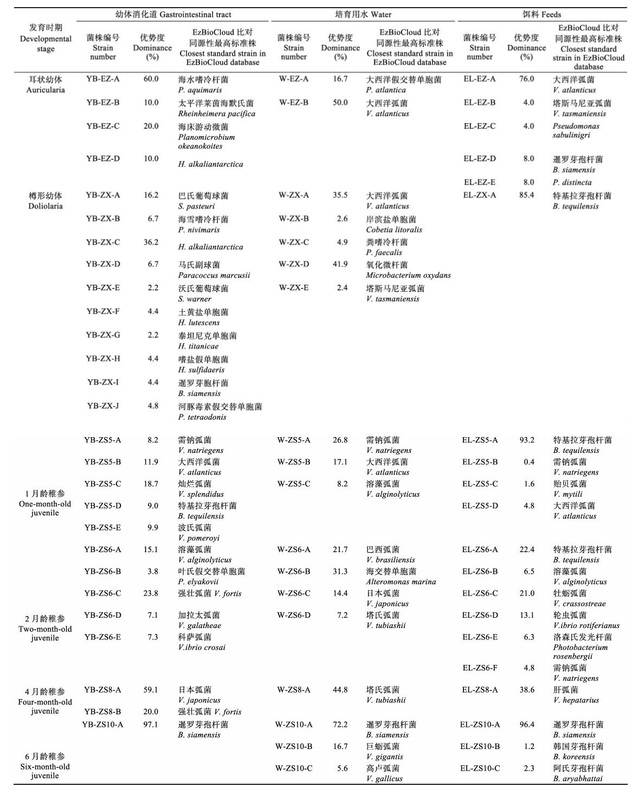 渔业科学进展, 2019, 40(2): 122-131. DOI: 10.19663/j.issn2095-9869.20180406003. LI Jing, LIAO Meijie, LI Bin, WANG Yingeng, RONG Xiaojun, ZHANG Zheng, FAN Ruiyong, LIU Anran. The Characteristics of Culturable Bacterial Microflora in the Gastrointestinal Tract of Cultured Sea Cucumber (Apostichopus japonicus) During the Early Developmental Stage and its Relationship with Environmental Flora[J]. Progress in Fishery Sciences, 2019, 40(2): 122-131. DOI: 10.19663/j.issn2095-9869.20180406003. Corresponding author: LIAO Meijie. E-mail:liaomj@ysfri.ac.cn. Abstract: Conventional bacteriological culture techniques and molecular identification methods were used to reveal the composition and structure of the intestinal microflora in sea cucumber (Apostichopus japonicus) larvae at different developmental stages and the microflora in the aquaculture environment (feeds and aquaculture water), and then the correlations between these were analyzed. The results of bacterial culture from sea cucumber larvae showed that there were no culturable bacteria during the stages preceding the development of the mouth (gonads, eggs, zygotes, and gastrula), but culturable bacteria did occurr after larvae developed a mouth and began feeding. From the auricularia to doliolaria larval stages, the number of culturable bacteria in the gastrointestinal (GI) tract was low. After the larvae reached one month of age, the abundance of culturable bacteria in the GI tract increased significantly, and the highest level (108 CFU/g) was reached in four-month-old juveniles. The proportion of culturable bacteria that were made up of culturable Vibrio species ranged from 2.2% to 77.3% across the different developmental stages. The results of bacterial culture from the environment showed that there was no significant change in the bacterial content in the aquaculture water over time. However, as the ingredients in the feed used for different early developmental stages of sea cucumber changed, there were significant differences in the bacterial content in these feeds. 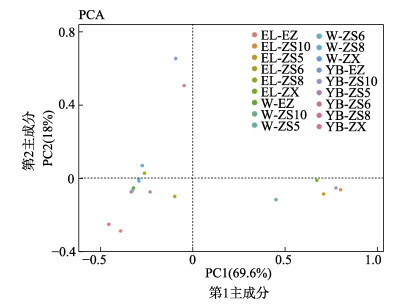 Sixty-five dominant strains isolated from the aquaculture system were identified by sequencing their 16S rDNA. They were classified into 14 genera and 43 species. Correlation analyses revealed that over the course of the development of the sea cucumber larvae, the bacteria obtained from their feed likely had a great impact on the microbial flora in their GI tracts. This study laid the foundation for the analysis of the formation processes and succession patterns of GI tract microflora in sea cucumber, as well as for the screening and application of probiotics in aquaculture.